FREEPORT—Patriots Co-Captain Josiah Rottari knocked a two-RBI single and sophomore Jake Dyer an RBI double in the top of the second on Tuesday afternoon, June 5, leading G-NG on a five-run spending spree. The Falcons never matched their guests’ big inning, and the prelims bout slow-burned its way to a 6-1 final. Patriots head coach Brad Smith credited his boys with “timely hitting, a rock-solid defense and a dominant pitching performance” in the win. Wil Shufelt started on the mound for G-NG, and threw ferociously: Shufelt relinquished a leadoff homer in the fourth, sure, but then proceeded to retire the Falcons’ final twelve hitters. Shufelt gave up just three hits all afternoon, struck out nine and walked only one to claim his fifth W of the spring. Shufelt also logged two doubles for the Patriots, who hashed 10 hits total. Likewise, Rottari and Dyer turned in two-hit performances. Of the two sides, the Falcons put together the stronger regular season, amassing 10 wins to just six losses for a sixth-place entry into the bracketing; the Patriots, meanwhile, went 9-7 to capture the 11 seed. Still, G-NG also emerged victorious when the teams first met, back on May 25th – a sign of parity in the League. Next up for the Patriots: A road quarterfinal at No. 3 Greely (10-6) on Thursday, June 7. The battle should be very much worth watching, as G-NG appears to be playing its best ball at just the right time. 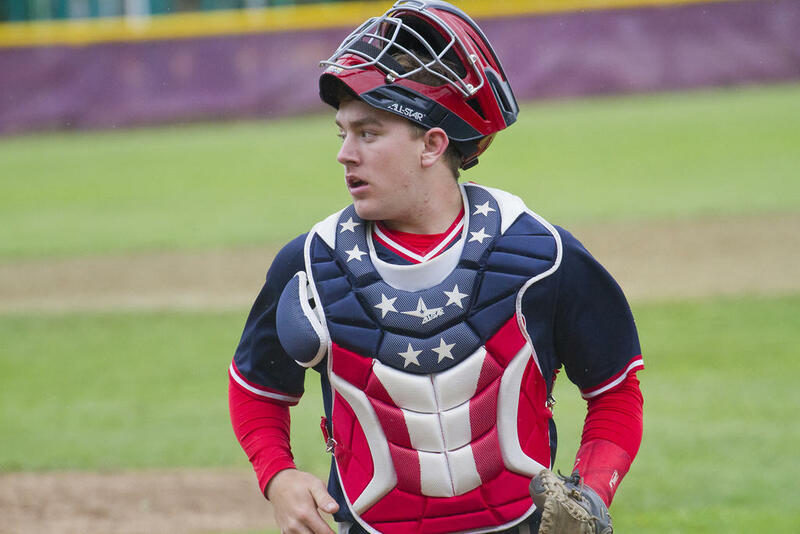 Nick McCann has manned the fort behind the plate admirably for G-NG all season long. Will Shufelt looked sharp against a strong Freeport team. Cam Andrews leads off first for the Patriots, destined for home. Jake Dyer inches off second for the Patriots. Patriot Cooper Winslow dives after – and barely misses – a Freeport grounder.